In London one can really try all kind of cuisines. Asian and fusion seems to be extremely popular, but European gastronomy is represented by some excellent restaurants and eateries. 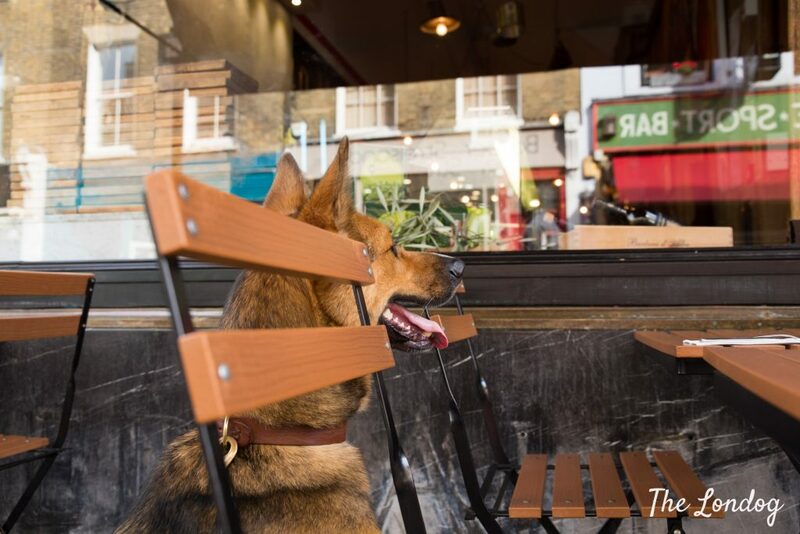 Today we tell you about our favourite dog-friendly Italian restaurants in London where you can try the most mouthwatering dishes. Over the years, my husband and I, with Argo, we have tried a number of Italian eateries. Some of them were very good or even outstanding, others left us very disappointed, as we found them either unauthentic or not getting above the threshold of what we consider the minimum standard (including a not-cheap East London Italian restaurant which seems to have a decent rating on Tripadvisor, where we possibly had the worst pasta dish ever). Apart from restaurants we visited, we also asked trusted Italian friends who are “buone forchette” (literally “good forks”, which in Italian means “people who enjoy food”) for more Italian restaurants recommendations around town. 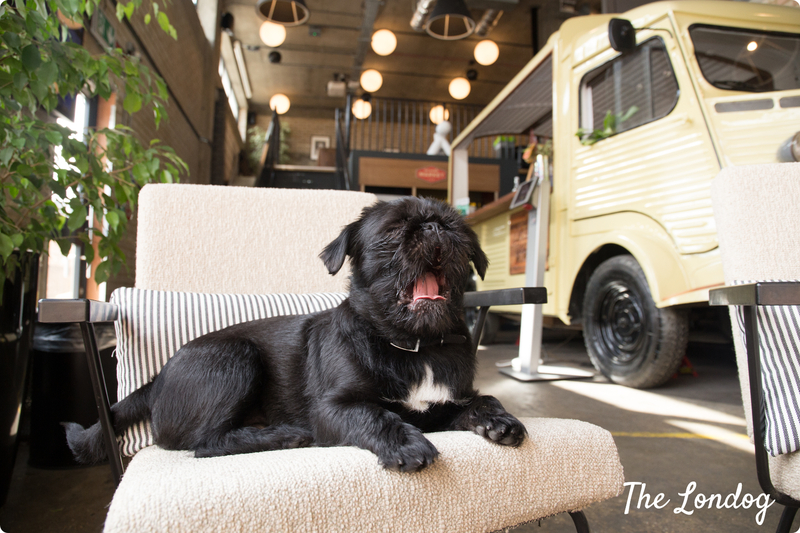 We put together a list, and scouted where dogs are allowed (and where they are not) and today we bring you our index of the best dog-friendly restaurants in London where you can order a decent Italian meal. As it is natural talking about restaurants, ratings are obviously subjective, but hope these tips will encounter your taste too. Before diving into the list, just a (sad) update. In Clapham Junction there is an Italian restaurant called Antica Osteria Bologna, which was recommended to us by a friend. Well, it used to be dog-friendly… as unfortunately, a despicable incident led them to ban dogs from inside their restaurant (they are only still exceptionally allowed in the terrace when it is open in the good season). 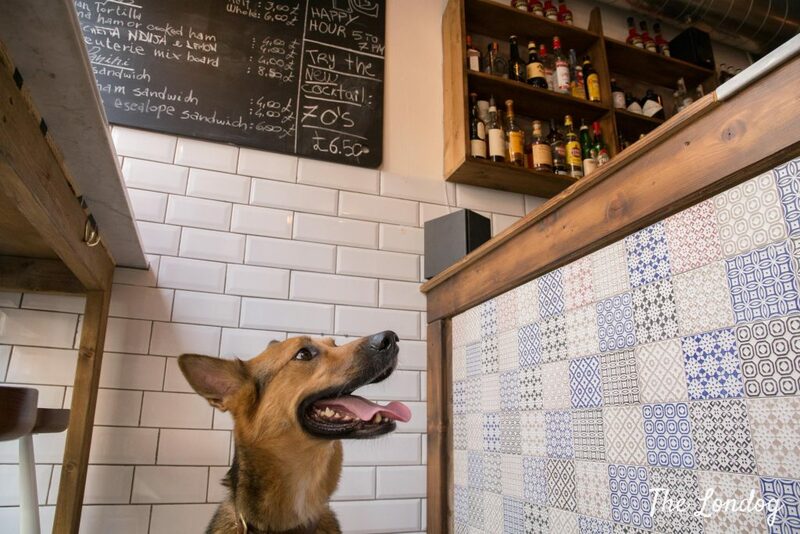 What happened was that a customer’s dog peed under the table during their meal; the customer did not notify the staff of the incident and after they left, other customers started complaining about an unpleasant smell, which led to the discovery. This just to highlight one key takeaway: it takes only one irresponsible behaviour to kick in dog bans and restrictions for everyone. Please help keeping dogs being welcomed by observing some key petiquette rules: always keep your dog on a short leash, keep their paws on the floor unless otherwise encouraged, immediately notify staff of any incident and help cleaning up, follow any other “house rules”. 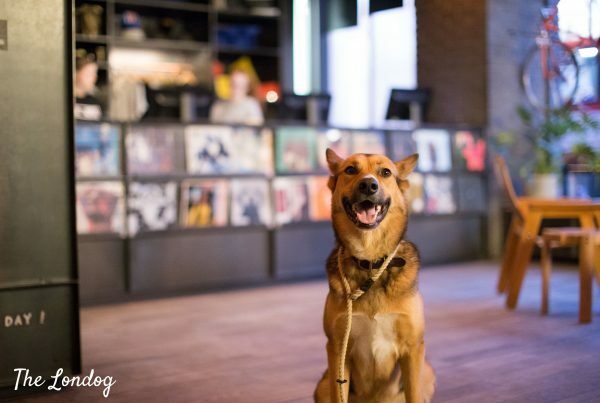 This will help dog-friendly places stay dog-friendly and nudge others to follow the example! Without any further ado, here you are our restaurant recommendations. 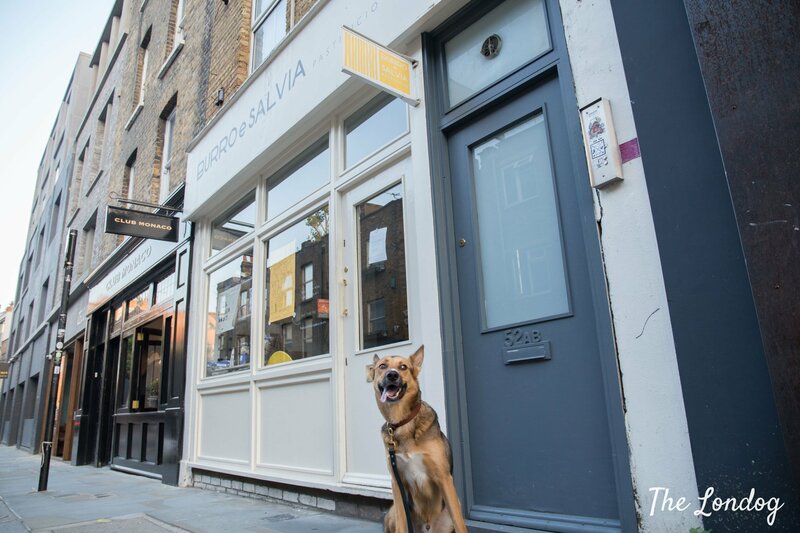 Burro e Salvia is probably our favourite eatery in London. Its name means butter and sage in Italian and, from outside, it may just look like a small fresh pasta shop. But it is far more than that. Not only you can buy some very good homemade fresh plain and filled pasta to cook at home, but they also have a few tables on the back where you can eat the finest meal (nothing to envy to big chef restaurants with not-so-exciting or tasty pasta dishes). The menu changes every month, so you can possibly never get bored of it, but there is one classic dish that is normally available: their signature Agnolotti Cavour (very recommended). And, guess what we love as well? That Burro e Salvia is dog-friendly! 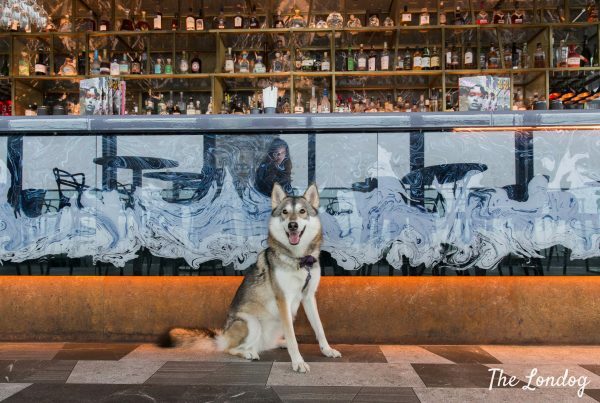 Due to the limited number of tables, booking is absolutely essential, and we would generally anticipate that we would be coming with our dog. 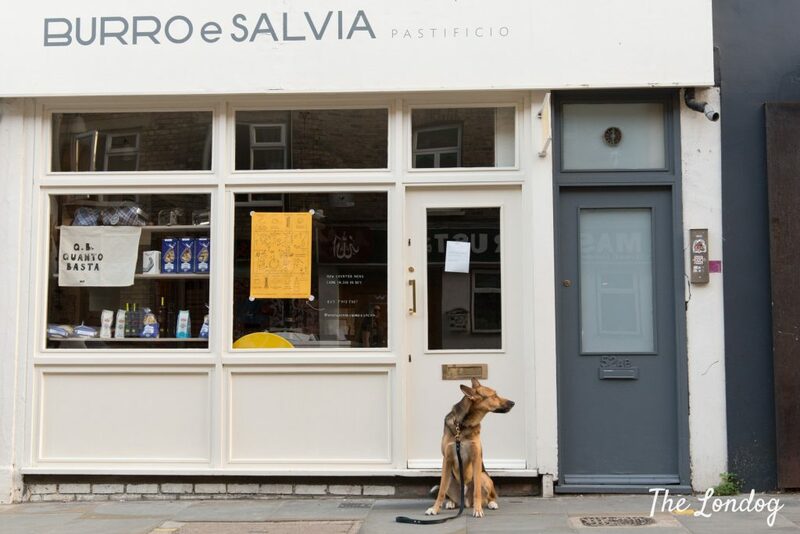 If you are looking for a different experience – but not dog-friendly this one, since ther will be ingredients on the table – Burro e Salvia also hosts workshops for learning the art of making fresh pasta (we have done it for our wedding anniversary and it was great!). Il Macellaio in Exmouth Market is another one of my personal favourites. It has a double soul too: a restaurant on one side and a tapas and wine bar next door. You could probably consider the tapas bar the Mecca for one particular Italian dish: the focaccia al formaggio, also known as focaccia di Recco (from the name of its native village, in the region of Liguria, in North-West Italy), a special super thin focaccia prepared with two layers of dough and Italian soft cheese ‘Stracchino’ in the middle, which melts when cooked. 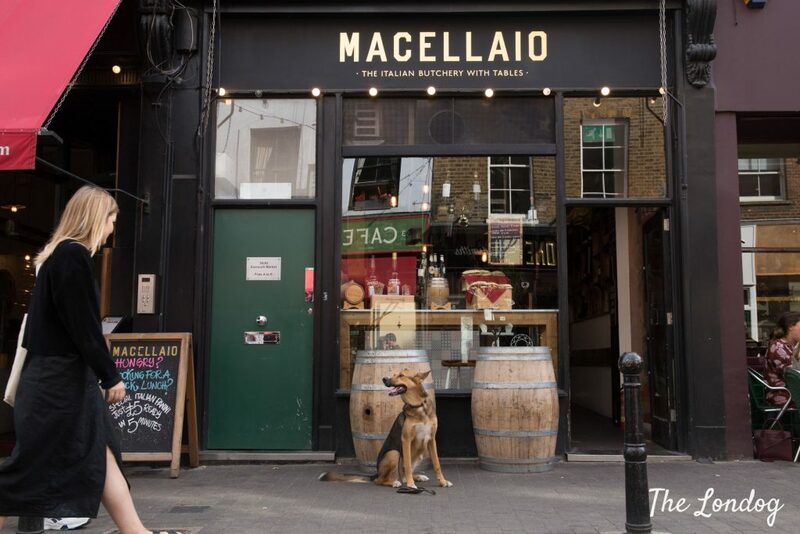 It is the only place in London where I found it so far, and I can assure that it is truly mouthwatering (it is one of my absolute favourite Italian dishes – if you want to learn the art, I also discovered that Macellaio’s Union Street branch hosts bakery masterclasses that includes focaccia di Recco baking). 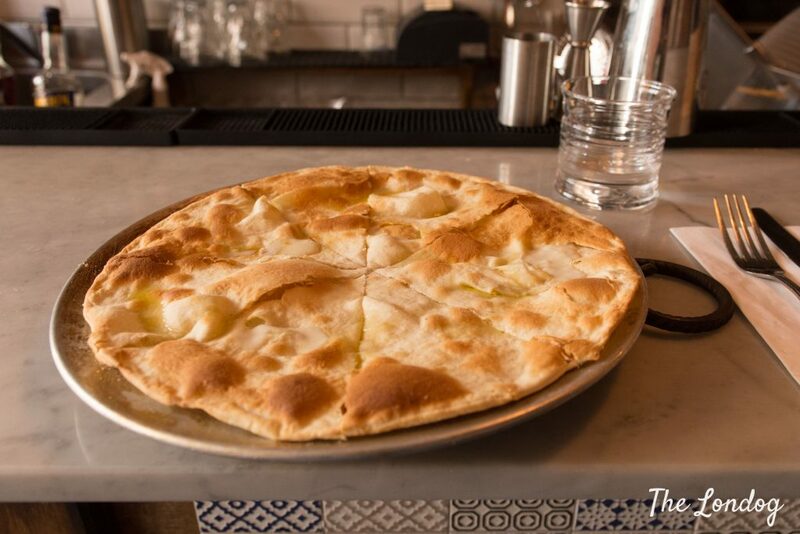 The venue has some high stools and you will eat at the counter or on a table, after they will have prepared your focaccia at the moment and cooked it in the oven just behind the counter. We regularly visit with Argo, and everyone loves dogs there. Prices are affordable and there is a great quality/price. Il Macellaio’s restaurant is specialised in Italian meat (they do Fiorentina, costata, etc.) and cheese, and I would say that it is not a place to go if you are a vegeterian or a vegan (or where to take your vegetarian/vegan friend or date!). Dogs are allowed in the restaurant, but two things to keep in mind: first, that the restaurant is very small and tables are very close to each other (especially the ones for two), so there is not much room; second, meat comes and goes all the time, in raw and cooked form, so make sure that they have very good table manners, i.e. they stay under the table and with their paws on the floor at all times. In general, it is best to let them know if you are coming with a dog when you book, they will aim to accomodate you in the back. They also have a couple of tables outside if you prefer. They told us that they have had four-legged small and medium-sized visitors and that they provide a dog water bowl upon request. We visited with Argo for a special occasion and although we found that the room under our table-for-two was definitely not enough for him, he did great and curled up on my feet and around the metal stand of the table without moving for our whole meal. In terms of prices, this is an upper restaurant, so for a starter, a main meat course and drink you will probably spend £60+ per person. 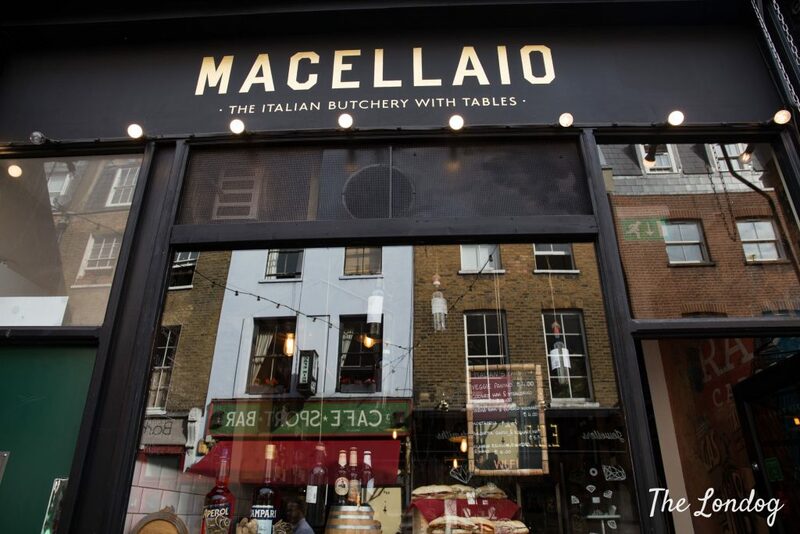 Il Macellaio has other branches across London, we will give you an update about those later. Another great place where to eat some mouthwatering pasta is Emilia’s Crafted Pasta, on St Katherine’s Docks, not far from Tower Bridge. 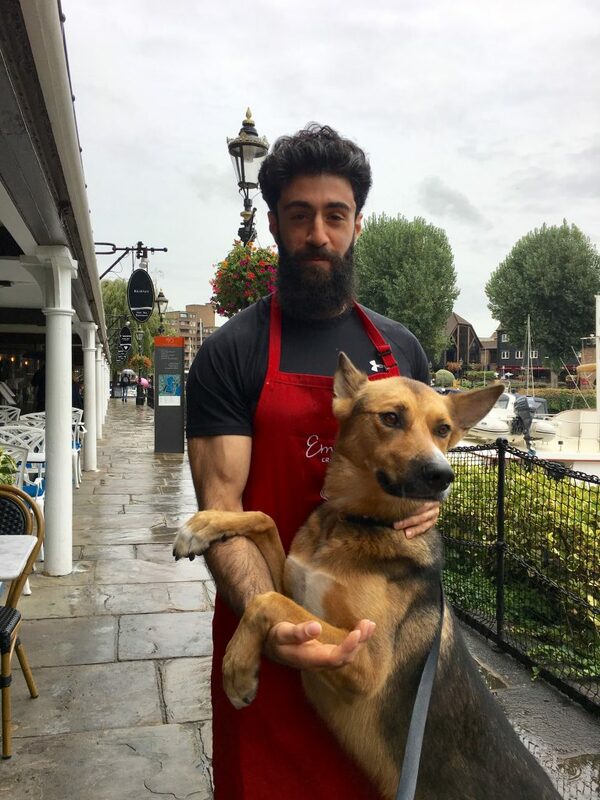 Although dogs are only allowed at the tables outside, probably due to the limited space inside, the guys are huge dog lovers. 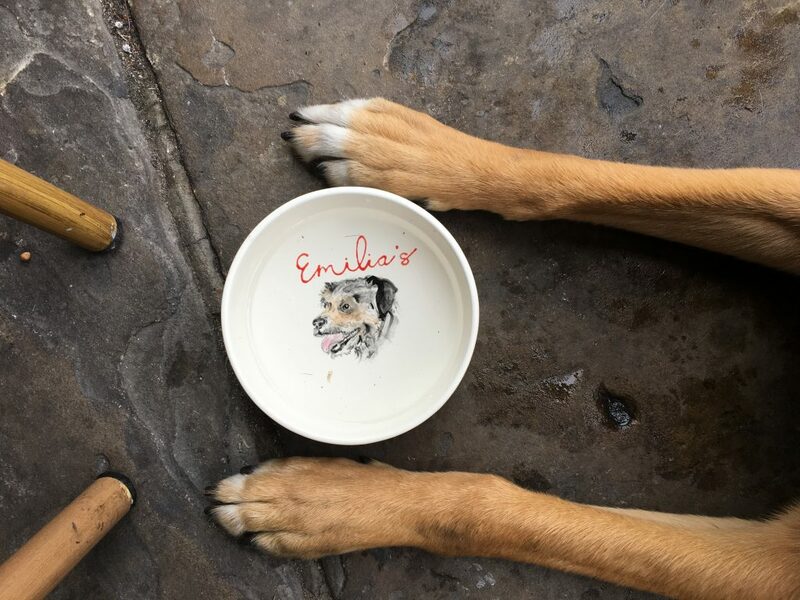 They have a dog bowl with Emilia’s branding, which they brought without the need to ask for it when we visited. One of the guys who run the place also brought some very yummi treats from the kitchen for Argo, ham and other meat! He also asked to take a photo with Argo, as he said he is a huge fan of dogs and likes taking photos with each furry visitor! We had a very good meal (I had the ravioli and my friend the pappardelle, with a dessert to share) and would recommend Emilia’s Crafted Pasta both for the food and the place, just better on a warm day, since you will be sitting outside. Italian Restaurant & Wine Boutique Satyrio is a fine-dining restaurant with a seasonal menu, by half Italian and half English chef Danny Martin, who trained with Michelin star cheft. We haven’t visited it, but we have heard speaking great about it from an Italian friend. We confirmed with the owner that dogs are allowed in the restaurant. It is a upper price level compared to the other restaurants. A friend spoke great about this little restaurant in Highbury. We haven’t tried it yet, but we confirmed with the manager that they only accept well-behaved small dogs due to the size of the restaurant (the tables are quite close to each other they said). They have a few tables outside too. More Italian restaurants and eateries tips will be added to this guide later. And if you crave pizza, don’t despair, it will be for another post. Thank you for your posts and reviews: very helpful. I look forward to joining in a walking outing at our earliest opportunity.